Download a blank fillable Form 735-173 - Application For Driving Privileges Or Id Card in PDF format just by clicking the "DOWNLOAD PDF" button. Complete Form 735-173 - Application For Driving Privileges Or Id Card with your personal data - all interactive fields are highlighted in places where you should type, access drop-down lists or select multiple-choice options. NOTE: YOUR ADDRESS BELOW MUST BE CURRENT. THE U.S. POSTAL SERVCIE WILL NOT FORWARD YOUR LICENSE OR ID CARD. that you are an anatomical donor? Oregon Department of Veterans' Affairs (ODVA) for the purpose of receiving benefit information. Have you ever had a driver license from another state, U.S. territory, or country? 2. Is your driver license currently suspended, cancelled or revoked? Skip this section if applying for an Identification Card. to any one of the questions below, we will not be able to issue you a license at this time. 2. Do you have any physical or mental conditions or impairments that affect your ability to drive safely? 3. Do you use alcohol, inhalants, or controlled substances to a degree that affects your ability to drive safely? will cancel and/or suspend my permit, driver license or ID if I make a false statement or present false documentation. or has a diploma or GED (proof of diploma or GED required). 807.065(1)(2): 50 hours and Driver Education or 100 hours, or has a valid license from another state. 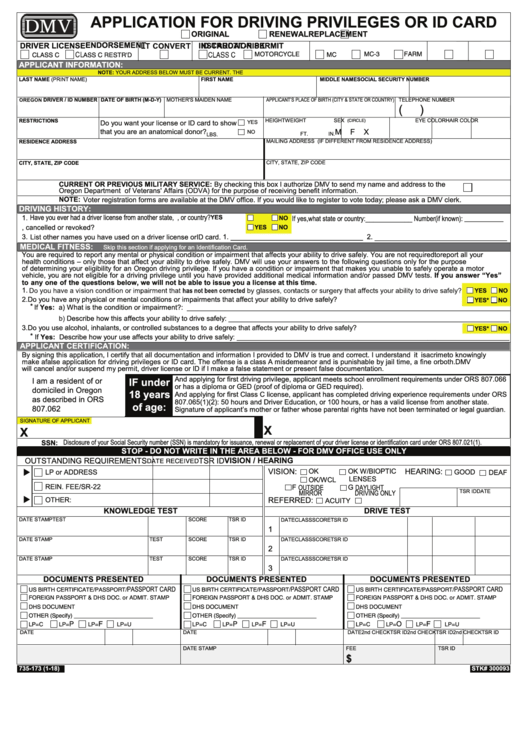 Signature of applicant’s mother or father whose parental rights have not been terminated or legal guardian. SSN: Disclosure of your Social Security number (SSN) is mandatory for issuance, renewal or replacement of your driver license or identification card under ORS 807.021(1).